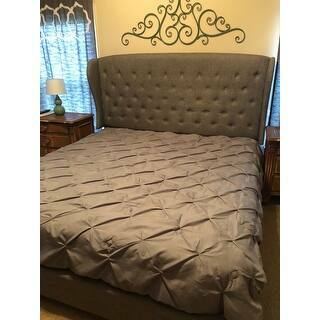 Loved the Vivianne Tufted Linen Wingback Bed with Nailhead Trim by iNSPIRE Q Classic! Looks great in my Master bedroom! Easy to assemble, and comfortable! Create an exquisite centerpiece in your bedroom space with the Vivianne Bed by iNSPIRE Q® Bold. 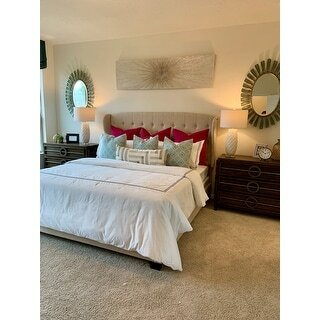 The bed features rich linen upholstery that is button tufted along the headboard and finished with bronze nailhead trimming. Not only does the bed bring comfort to your space but adds a touch of grandeur and refinery with the sophisticated wingback headboard with curved wings. The beautifully designed bed will fit perfectly in any classically styled bedroom to a more transitional space. Choose from beige, grey, or dark grey linen upholstery. Available in full, queen, and king sizes. This product ships in two (2) boxes. Boxes may arrive separately. One of my worst purchases so far. The bed is poorly designed. The 4-5 slats thar come with it are just not enough to keep the mattress from sagging and sinking down at places where there is no support. Gave me body aches. I desperately wanted to return it, but it was too much of an effort and cost to disassemble it, pack it, transport it (I live in 3rd floor) and pay for the rerun shipping of this “oversized” item myself. I was forced to buy a spring box for my mattress, an extra expense on top of this overpriced bed. The side bars of the frame rise just a few inches from the floor, leaving almost no space for any kind of storage under bed. The headboard is huuuge and this is not a bed for your average sized bedroom. It stands at a height from the base, leaving an ugly gap between the mattress and the headboard’s lower margin, even with a 13 inch mattress. Don’t understand the concept behind a super low bed base with an obnoxiously tall headboard. Wish I had not purchased this bed. Overall I'm very happy with this purchase. The bed is beautiful and seems well made. The base is sturdy. The headboard unfortunately does move a bit when you push on it so we're going to try adding a few more screws to the back. Even though it moves a bit, it doesn't feel like it'll fall apart and you really have to push it for it to move. The assembly was relatively easy. If you're patient, strong and skilled, you can probably do this on your own but ideally you need two people. I'm 8 months pregnant and was only needed to hold things in place. We bought this for my 14yo daughter. She and I assembled it together and it was quite easy. She loves it, and for the price I am not disappointed in it for a teen. I would not purchase this bed for adults or children who are rough on things. It simply is not sturdy enough and the design has the headboard quite top heavy and it is easily wobbled. The base is strong and secure, just not the headboard. I may be looking for a way to anchor it to the wall to keep it from banging. There is also barely a couple inches clearance from the floor so under the bed storage is completely out of the picture which really disappoints me. You will also need a bedside table on each side of at least 24 inches tall to cover the fact that the wings do not extend to the floor and it looks quite cheap with it showing (look at the photos closely). You will need a regular thick box spring because it sits down in the base and the bed would be too low without it. All in all I am glad my daughter loves the bed and it does look nice with the bedside tables. I adore this bed! I ordered this after a long search for a tufted headboard. This bed was so easy to assemble. The fabric is thick not easily torn and is tufted just perfectly. It seems very sturdy and stain friendly over all top notch quality bed. I did use our metal bedframe instead of the wooden flats that are included. But only due to the fact we have a two piece box spring and it seemed to fit better with the metal fram. I love the color dark charcoal gray it is spot on with the picture shown. It feels luxurious and yet very neutral also. You can dress it up with throw pillows or keep it simple either way you can not go wrong with this bed option. I absolutely would recommend this bed,I actually I have to several already!! I feel like I have an adult bedroom FINALLY! This bed is beautiful. It arrived in two big shipments. Easy to assemble but you do need two people to unbox and assemble or else it will take you a few hours. The color matches the stock photo. I can't wait for the matching ottoman benches to arrive. The bed arrived in two boxes relatively quickly. Assembly was fairly easy with two people, and didn't take long. We're impressed with the sturdiness of this piece; it doesn't move or shift at all. We have an average box spring with an average to slightly thick mattress, and the overall bed looks great. There's a slight gap below the headboard, but it looks and feels normal. The height of the bed is normal and comfortable. The wingback style has given our master bedroom an elegant look. Very happy with this purchase! Absolutely love this bed! And it’s very sturdy as well & only took my husband 30 mins to put together by himself. I have the king size & a normal box spring & mattress on it. It needs a boxspring for sure. I still need to add accent colors to the bed! 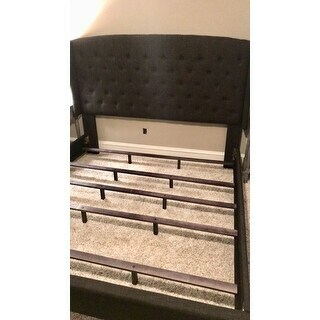 Although I had some issues with receiving this bed from the delivery company Ceva, Overstock was so gracious and went above and beyond to rectify the situation. This bed is gorgeous and I put this together with my 13 year old nephew in an hr. Very happy with this purchase! This is the King Size!! I haven’t set up bed yet but the color is as expected and delivery was efficient. I’ll update review once I’ve set it up. Don't think twice. Just buy it! I love coming home and laying in my huge and luxurious bed! Exactly what I was hoping for! Love the look & how durable & solid this bed is amazing!!! Would & will highly recommend family & friends to check out this site & see what all the fuss is about. Amazing!!! The bed was not made too well. Called in to have the legs replaced and received the wrong parts. I just chose to keep the bed to avoid the trouble of returning the huge bulky headboard and footboard. The bed arrived early! Which is awesome. The bed was easy to assemble. An added plus to this bed, is it actually absorbs noise from our air conditioner vent. It is beautiful and makes our master bedroom look more luxurious. The beige goes great with our dark brown walls. I initially ordered from one of Overstock's online competition. I cancelled the order because they took over a week to process the order and still had not shipped it. Overstock was great with the ordering and shipping updates. Great Bed for the price......sturdy and great fabric!!! Great product and very easy to assemble. I still don't have the headboard and I ordered it on President's Day. The upholstered rails were soiled with what looked like smudges from someone's dirty hands. The peg legs are really flimsy. If I ever get the headboard, I'll edit this review, but as you can see, now, I'm very dissatisfied. It is difficult to assemble, but once you get it done, it is a nice bed. Quality is inconsistent however as I purchased two. The first one had all working parts. The second one the railings hardware were bent and we are still trying to straighten the metal pieces to make it work. Beautiful. Very easy to assemble. I'm very happy with my purchase. I love the size of this bed and the huge headboard. It’s Just what I need. The Color is cool, and it bought out the beauty of my room. Il definitely recommend to people. Beautiful style, great color options, perfect price. "What is the weight limit and is the headboard detachable "
The maximum weight limit is approximately 500 pounds and the headboard needs to be attached to the bedframe. "Is the mattress included? " Unfortunately we do not provide the mattress, just the bed frame/headboard. "Can someone confirm the length of the Full/Double bed frame at 92.5"? It seems longer than any other bed frame I have seen by a good 10"." Yes, the full size is 92.5 inches long overall. Hello, I have the same question about the length. Why is this so long? "Will a Sleep Number c2 work with this?" "Do I have to buy a box spring "
Yes, this bed requires the use of both a mattress and box spring. "Will a select comfort bed fit with an adjustable base fit?" Safavieh Blanchett Light Grey Linen Upholstered Tufted Wingback Bed (Queen) - 88.3" x 65.5" x 55.5"